This was published in the Fall 2012 issue of Ricepaper Magazine. At this year’s June 4th anniversary, I was in Hong Kong covering the 22nd annual candlelight vigil in Victoria Park on my first day as a reporter for the South China Morning Post. Yet I wouldn’t be here—beginning to work as a journalist in China—were it not for Jan Wong. Jan, often hailed as one of Canada’s toughest reporters, was in Beijing the night of the Tiananmen Square massacre. When the police started shooting, she listened to the students frantically debate whether to stay or go. Jan spent the rest of the night watching what was happening from her hotel balcony overlooking the square, even as bullets sprayed towards her. Six years ago, when I was eighteen and didn’t have a clue what to do with my life, I read her first book, Red China Blues: My Long March from Mao to Now. In the memoir, Jan wrote about her experiences as a Red Guard and Maoist fanatic during the Cultural Revolution. She didn’t hold back with the unflattering self-descriptions. Red China Blues inspired me to learn more about China’s turbulent past and present. At McGill University, Jan also first became interested in China as a history student. She wanted to become a Sinologist, and originally went to Beijing to study Mandarin. She didn’t plan to get swept up in the Cultural Revolution—a decade-long factional struggle that led to the persecution of millions of people. My family had immigrated to Vancouver as part of the exodus leaving Hong Kong after the 1989 Tiananmen massacre. When I was growing up, Asian kids would often call me a “banana”—yellow on the outside but white on the inside. Strangers would ask whether or not I was “full Chinese,” since real Chinese girls can’t possibly be 5”9 and play hockey. So even as I combed through Chinese historical archives and took Mandarin lessons to prepare to report in China, I always doubted whether I would ever be able to understand China—and doubted why I was so keen on going there in the first place. Was I just going through an extended adolescent identity crisis? My dinner with Jan helped me resolve some of those inner conflicts, and even taught me something a therapist should’ve said to me years ago. I was home in Vancouver for a few days between graduating from Columbia Journalism School and heading to Hong Kong for work. On my first night back, my friend Todd Wong from the Asian Canadian Writers’ Workshop invited me to a launch party for Jan’s new book, Out of the Blue. 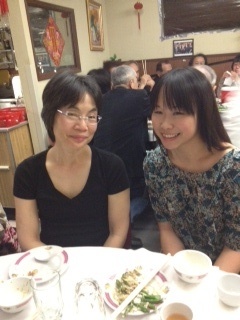 Vancouver Chinatown’s historic Foo’s Ho Ho restaurant was filled with literary types of all ages. When I saw Jan arrive looking happy and radiant in a pink floral blazer, I barely got through introducing myself before she invited me to sit next to her at dinner. After insisting that I have more of the Egg Foo Yung, she good-naturedly answered my torrent of questions. “It’s great to meet a fellow j-school graduate,” Jan said, explaining that when she became disenchanted with Maoism, but not with China, she decided to become a journalist. She moved to New York to get her Masters of Journalism at Columbia and graduated in 1981. Seven years later, she became the first Chinese woman to serve as bureau chief of the Globe & Mail’s Beijing bureau. Jan was interested in anything related to China, but after a while, she realized that she would never belong there. “At first I was happy because I blended in. But once I learned the language, I realized I wasn’t Chinese. I was not at all like the people around me. I had a completely different approach to things,” she said. Jan, who is 60 years old, was born in Montreal, and her family had lived in Canada for four generations. Her great grandfather helped build the railroad through the Rockies and her father owned a chain of restaurants that popularized the now ubiquitous Chinese buffet. “I’m Canadian. Just because I’m not a white person doesn’t mean I need to hyphenate myself,” she explained. Talking to Jan made me realize that being a cultural outsider would be an asset as a journalist. She said that people in China would be more likely to open up to me since I’m ethnically Chinese, but I’d also find it natural to remain objective because I was raised in the West. Everything Jan said to me that evening was very helpful, but the most significant thing I learned from her was to make sure to take care of myself, even as I go hard after my career goals. Her latest book, Out of the Blue, is about how she fell into a deep depression after a controversial story she wrote for the Globe & Mail ultimately led to her getting fired from a newspaper she had worked at for over 20 years. In 2006, Jan published the article “Get under the desk,” where she drew a connection between three different school shootings in Quebec, implying that since all the shooters were not old-stock Québécois, the violence was related to problems of alienation in a society concerned with racial purity. After the article was published, Jan received multiple death threats, an official condemnation from Prime Minister Stephen Harper, and her editor wrote a column throwing Jan under the bus by saying that she should not have included her opinion in the article. Her story had touched a nerve. Jan succumbed to depression in part because her whole existence had revolved around journalism, and while she struggled for two years to recover, her newspaper refused to recognize her sick leave and even accused her of lying about being ill, leading to a lengthy legal battle. I’ve been reading Out of the Blue in Hong Kong,and it has made me reflect on my depression, which lasted a total of around two years, too. At my worst, I was having panic attacks where I felt like I was being suffocated from the inside, eating extremely erratically, and wandering around construction sites at night. I definitely didn’t feel like reporter material. For years, I had seen my history of depression as my weakness. In the back of my mind, I worried that venturing out on my own to work as a foreign reporter would lead to a relapse, since I wouldn’t have a support system of friends and family around me. But Jan helped me view my past experiences as a source of strength. In Out of the Blue, she cited research showing that after suffering from depression, most people coped better with life’s trials. “Now if only we could overcome the stigma and talk openly about depression. We might gain a more acute appreciation of the human condition and learn how to weather adversity,” she wrote. Near the end of dinner, Jan turned to me and said that I should be very excited about my future. “China is a journalist’s dream. If I wanted to write another book, all I’d have to do is live there, and within a few weeks I’d find a topic. You’d love it,” she said with a reassuring smile, sensing that I was nervous. At the end of dinner, Todd surprised me by bringing out a birthday cake and having the whole restaurant sing me happy birthday. Jan was delighted, clapping as she wished me a happy birthday and good luck with my career. It was the best send-off I could have imagined. I look forward to reading Jan’s books. It’s rare when meeting your hero is everything you thought it would be. Thanks for sharing this great piece.